A couple in northern France has won a legal battle to have 10 wind turbines taken down because they spoil the “bucolic and rustic” view from their 18th century chateau. The ruling is seen as a major victory for guardians of French heritage and has sent alarm bells ringing throughout the country’s wind farm industry. It is the first time a court has ordered operating wind turbines to be dismantled. 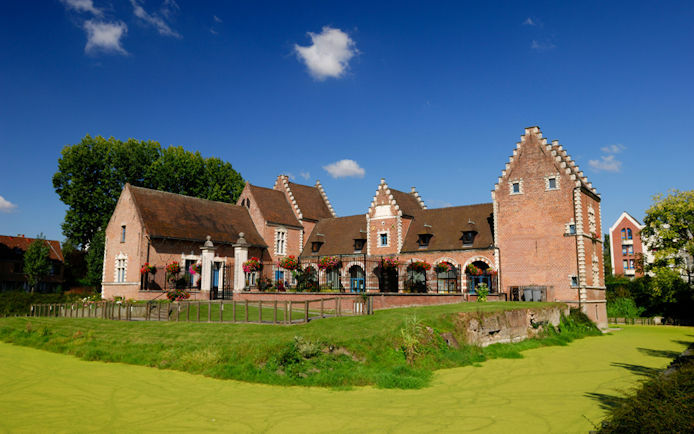 When Erik Wallecan, a retired vet from Belgium, and his wife Ingrid, bought the Chateau de Flers in the Pas-de-Calais in 1996, it was a dream come true. With the chateau in a state of disrepair, they spent a decade restoring the listed building with 42 acres of land to its former glory. They then set about transforming part of the building into a guesthouse. In 2007, they were horrified to discover that their view had been blighted by the construction of 10 wind turbines each 360ft high. “The first evening when we arrived in the chateau (from Anvers in Belgium) after their construction, it was a firework display; we wondered where these lights were coming from. We were not even aware that these (wind) projects existed,” Mrs Wallecan told Le Monde. Three huge turbines are visible when gazing across the park from the bay windows in the chateau’s grand salon. “Every day we have to suffer the visual and noise pollution. I can see the turbines from everywhere in the castle, from every room,” said Mr Wallecan. Furious, the couple took the turbine operators, La Compagnie du Vent (The Wind Company), a subsidiary of the energy giant GDF Suez, to court. Judges in Montpellier ruled that the turbines’ location blighted the countryside, causing the “total disfigurement of a bucolic and rustic landscape”. Besides the turbines “spoiling the view”, the judges also cited the “groaning and whistling” and “unsightliness of white and red flashing lights”. The company was ordered to pay the Wallecans €37,500 (£31,500) in damages and to remove the wind farm within four months or face a fine of €500 per day per turbine. The turbines remain in place pending an appeal, but their critics say the ruling still heralds a historic victory. The ruling follows a series of high profile campaigns against wind farms in France. In August, a French court banned a local council from erecting turbines near the Mont Saint Michel abbey island after Unesco warned they could cost France’s most visited provincial tourist site its World Heritage status. A plan to build a vast offshore wind farm within view of several Normandy D-Day beaches was recently condemned as “an insult to the memory of the thousands who died there”. The government has insisted the project will go ahead. Last year, villagers in Ferreières-Poussarou in the Hérault department, southwestern France, took their mayor hostage for a day and a night after learning of his plans to build 10 new turbines. Local authorities say such farms provide a welcome financial boost. Jean-Luc Faÿ, head of a group of villages including the chateau, said each turbine represented €12,000 a year for the community, which has helped fund a swimming pool and sports hall. “Due to two people, there is a knife under the throat of an area of 6,700 inhabitants,” he said.